Information: A privately published, limited-edition handout for attendees of GatchaCon '98. This show was held as part of the San Diego Comic Convention. 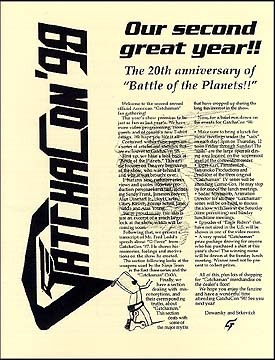 The fanzine included a history of the beginning of "Battle of the Planets," complete with exclusive cast/crew interviews, the 1997 GatchaCon '97 speech from Fred Ladd about "G-Force," the weapons that the Ninja Team used in all three series and the OAVs and finally a section about the many myths and truths surrounding "Gatchaman."